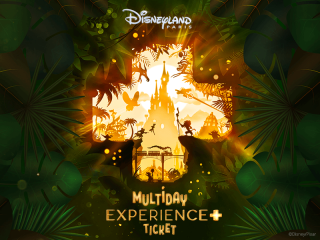 The Disneyland® Paris Experience+ Ticket gives you access to both Disneyland® Park and Walt Disney Studios® Park, with the ability to hop between both Disney® Parks as many times as you like for the duration of the ticket. Also included is the fantastic Standard FASTPASS® system, a free, time-saving service that shortens your wait at the most popular attractions in Disneyland® Park and Walt Disney Studios® Park. Privileged Illuminations Viewing Area Access: Experience the spectacular nighttime show from an exclusive area. Take advantage of a guaranteed space to see the unforgettable fireworks, light projections and special effects in style. Money can't buy access to this area! Please note: this segment must be used on the first day of your ticket. Super FASTPASS®: Guaranteed FASTPASS® access to three rides - Buzz Lightyear Laser Blast (this will be unavailable from the 27 May –14 Jun, during which time the guest will be able to ride Star Tours: The Adventures Continue instead), Peter Pan's Flight & Ratatouille: The Adventure. This must be used on the second day of your ticket and is limited to one ride per attraction. 15% Dining Discount: Save 15% per person on table and buffet service dining for the number of days selected. Valid in selected restuarants in Disneyland® Park and Walt Disney Studios® Park, Disney Village® and Disney® Hotels. 20% Merchandise Discount: Save 20% on any merchandise purchase of €60 or more. Valid for the number of days selected and can be used as often as you like! Only a limited amount of these exceptional value tickets are made available each day so BOOK NOW TO AVOID DISAPPOINTMENT! You will receive a print and go Disneyland® Paris voucher. This is easily exchanged at one of the ticket windows at Disneyland® Paris where you will receive your ticket and all Disneyland® Paris Experience+ extras. Disneyland® Paris Ticket Vouchers will be uploaded to your online order, and you will receive an email when they are ready to download. Please note - If you are not travelling within the next 72 hours then it can take up to 7 days for your tickets to be uploaded. All Disneyland® Resort Paris Tickets include the fantastic Standard FASTPASS®, a free, time-saving service that shortens your wait at the most popular attractions in Disneyland® Park and Walt Disney Studios® Park. The FASTPASS® is operated on a rolling basis so you can only ever have one FASTPASS® at a time. This is done in the park and cannot be done in advance. To get your Standard FASTPASS®, approach the ride you would like and you will see a FASTPASS® kiosk if the ride participates in FASTPASS® – normally next to the main queue. There will be a time displayed above the kiosk and this indicates the time you can return to join the FASTPASS® queue. You need to scan your tickets at the ticket machine and you will be given a Standard FASTPASS® ticket. You then return to the FASTPASS® queue at the time indicated. FASTPASS® is subject to availability. The first 2 days of the 4-Day/2 Park Disneyland® Paris Experience+ Ticket MUST be used commencing from the day selected when booking. The third and fourth day can be used anytime within 8 days of the first date of visit. Disneyland® Paris Experience+ Ticket is only on sale until 29th August 2019 with the 30th August 2019 the very last day a ticket can be commenced. Dining discount: Valid at Disney Hotel restaurants - La Cantina, Chuckwagoon Café, Crockett’s Tavern, Hunter ‘s Grill, Cape Cod,Yacht Club, Inventions*, California Grill; Disneyland Park: Silver Spur, Plaza Gardens*, Auberge de Cendrillon*, Agrabah Café, Captain Jack’s, Walt’s; Walt Disney Studio: Restaurant des Stars, Bistrot chez Rémy; Disney Village: Annette’s Diner, The Steakhouse Village, Café Mickey* & La Grange. Note: Some restaurants may be closed during certain periods. *Character Dining opportunities. The dining discount is off the total transaction including all drinks and food. The discount is not combinable with any other discounts. The merchandise discount is not cumulative and not combinable with any other discounts. If any of the products that the guest is purchasing have already been discounted, the reduced price will be included in the total transaction value. Merchandise discount is valid in Disneyland® Park and Walt Disney Studios® Park, all Disney® Hotels shops and in Disney Village® boutiques, except Lego Store, Planet Hollywood, Starbucks, Gaumont, Rainforest Café, King Ludwig's Castle and as well Golf Goofy's Pro Shop. Not applicable on certain items; please ask in-store for details. Super FASTPASS® 3 Family Attraction is a dated product that gives access to 3 predefined attractions with FASTPASS® access, once for each attraction. FASTPASS® is valid during the second day only. If guests are unable to use their FASTPASS® for any of the specific attractions on the day of visit, the Cast Member at the attraction will handle/propose an alternative if necessary. The ticket does not give priority access within the FASTPASS® queue and is not valid during special events. Operating hours of the attractions are subject to change. Attraction may be closed without notice. The FASTPASS® services can be used from 10.30am (times subject to change) at the attractions mentioned above. There is a maximum of six tickets per booking.